Do You Know These Basics About Elliptical Trainers? Are you thinking about buying an elliptical trainer to get in shape? Well, before you “run” out and do that, I should be able to save you the trouble of reading a bunch of elliptical trainer reviews and listening to the dudes ramble on at the fitness store. Let me offer you some helpful tips below that will help you figure out which elliptical exercise equipment will work best for you and what you want it for. 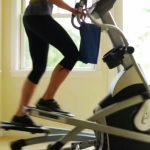 But first… let me say that I do NOT feel that elliptical exercise equipment is necessarily the best way to get in shape… OR the best place to spend your money if you are wanting to buy exercise equipment. 2 So What Are You Looking For When Buying Both New And Used? 3 Drop Everything And Buy An Elliptical? Elliptical machines can provide you with a great cardiovascular workout in a very controlled environment and I think THAT is its biggest positive factor. It’s not that the workout is superior, but that you can control it. Therefore, if you have injuries or the weather is terrible, you have the ability to do what you need in a controlled environment. You can be at a beginner or advanced fitness level, and the elliptical machine exercise level can fit to your exercise level. Sticking to an exercise program sometimes depends on the comfort level for some people and if that’s you, then do what you need to in order to get the ball rolling. Many people like an elliptical trainer because it works in a smooth, flowing manner that has you just rolling along, grooving to your tunes. So, having said that, keep in mind that a key part of this groovy movement depends on your stride length. Some elliptical exercise equipment on the market has a 14” stride while others have a stride length of 21”. See which one suits you and keep it in mind if you are looking at elliptical machine reviews and can’t figure out why the huge price difference in some models. The one thing I do like about the elliptical machines is how quiet they are. With most, you can watch TV while you are working out – they are so quiet. With a treadmill, you can build up quite a racket. I can almost hear you say, “Watch TV”? Yup, I said it. If you do decide to do some long steady state low intensity cardiovascular workout and the weather is crappy outside (if that matters to you), watching some TV helps the time pass. Heaven knows you won’t be doing any reading on elliptical exercise equipment. Well, unless you want to barf. It’s like trying to read on a boat. So What Are You Looking For When Buying Both New And Used? Check out everything about the machine if you are considering going the used ellipticals route. Safety and operating function are something to look at if you are planning to buy a used elliptical trainer. Check that all the parts are in good working order and check to see if the warranty is still valid. Not that it would be the make or break buying factor but it would factor in the price you are willing to pay if the warranty is still valid. You don’t want an arm to come off just as you get into full swing after having hauled that sucker all the way to your house. Actually, speaking about the house, check the ellipticals dimensions, not only at rest but also how far out all the parts move as well as ceiling tolerance once the tallest user is standing on it. Some people never think of this and then find their hair brushing the ceiling of the basement once it’s home and set up. This brings up the topic of delivery and set up of your elliptical training equipment. All I can say is yes please. There is a lot of headache from getting a vehicle, proper set up, warranty being voided and simply the time and hassle of getting it up or down stairs. If you have the cash, have someone else deliver it and set it up. Another little perk of an elliptical machine is that most come with a heart rate monitor. A heart rate monitor will help you work out in the zone that you deem most beneficial. That could be to progressively increase your cardiovascular capacity, burn fat, increase output or what have you. Whatever it is, the heart rate monitor can be a handy tool. If your elliptical does not have the capacity to monitor your heart rate, it’s not a big deal especially if the price is right. You can either just go until you sweat , measure it by the clock, or buy a cheap one online or at almost any store these days. If you are a heavy individual, check the weight capacity of the machine. Hopefully, soon it won’t matter as you burn off all those pounds but first you have to get on there and do the work. So look in the manual and see what the upper weight limit is for your particular piece of an elliptical machine. Drop Everything And Buy An Elliptical? Some people really key in on elliptical training because it offers you a lightweight resistance component to your cardio workout which is a slight plus because, weight resistance workouts burn calories faster and more efficiently. Kind of – I wouldn’t want to mislead you and have you think that ellipticals can in any way replace your regular resistance training. Any extra calorie burning that you get out of the resistance arms of an elliptical could always be gotten outside by sprinting uphill or even doing circuit training if it is a resistance slash cardio workout you are looking for. I would argue that either of these would be vastly superior actually. People selling exercise equipment say that in today’s busy world everyone is limited on time, so why not optimize your exercise time by using fancy equipment. I think the real thing is if you enjoy doing your exercise on an elliptical, and thus stick with it and do it more frequently and harder than other forms of exercise, then you bought worthwhile exercise equipment. You don’t however need them and they are not better than anything else in general. What I am saying is that you will not get in shape faster than you would by using any other method just because you spent a good chunk of money on it. Elliptical trainers have a negligible stress on your joints. Is this a good thing? Well, yes if you are injured and need to be low impact or you simply cannot exercise. Nevertheless, if you are healthy, I think low impact can be a bad thing. If you are healthy, you are meant to jump, jog, walk, sprint, squat, bounce and generally have fun! So on that one, I think the benefits of elliptical machines being low impact depends largely on the individual and why or what they are training for. If you are training to be athletic, I think you’re barking up the wrong tree. Therefore, if you are injured, because you do not need to remove your feet from the footpads, there is little stress on knees, ankles, hips and back. Many people with joint problems feel that they have to give up on exercise and this can lead to a bad downward spin especially if you have a healthy appetite. So sometimes, the low impact of elliptical trainers can be a saving grace. Most elliptical exercise machines will come preset with various types of workout programs. 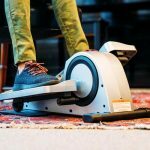 If variety in your workout routine is important, then look for an elliptical trainer that has preset personalized workouts for you to choose from its onboard computer. When I get on a machine, I usually use the manual setting and try to hit a calorie total in a certain period. Using that as a gauge, you can adjust either the resistance or RPM’s accordingly. There are a ton of brands of ellipticals on the market today. In the end, despite what the elliptical ratings and reviews say, the best elliptical equipment for you is the one that has all of the features that you are looking for in an elliptical. Therefore, you’ll be looking at all the factors we mentioned above like noise, price, features, size, warranty and so on. If it does what you want for the price you want, then you’ve got yourself the right machine. However, please… don’t forget about running outside. 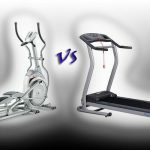 Treadmill vs. Elliptical Trainer – Which one is better?